Drifter Jack blows back into his friend Frank's life just as his life is going sideways. When a murder occurs occurs the two men decide to bury the body but there are complications on the road to the burial. 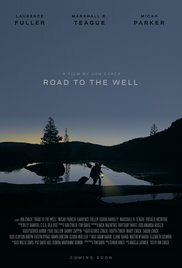 Jon Cvack's ROAD TO THE WELL surprised the hell out of me. Not only is it a great little modern film noir, but it's also a film that is so well made and so self assured that I'm having a hard time believing that this is Cvack's first shot at directing. Say what you will a first feature is rarely this well done. Cvack's tale is a nifty one and I'm having a hard time trying to work out how much to tell you. A layered mystery/crime drama the film is content to show us bits and pieces without comment and let us stew a bit. This is one of those films where something will pass by and then fifteen minutes or more something else will happen and you'll connect up to something that happened earlier, so I'm not sure how much to reveal. One has to mention the finely crafted script which moves everyone in a believable fashion. Too often in films like this people are not people they are types. It's an easy short hand that is really avoided here. People behave as if they are regular people which is nice. Their behavior is true to their own point of view and not that of the audience. Cvack resists the temptation to play many scenes as if there is is anything wrong. More often than not films are set up so when there is something wrong the risk of discovery is played up for tension- here Cvack does the opposite people behave straight forwardly. There is no overt pushing of the tension and the fear. Its a small mater that lets us create the fear. One should also wax poetic about the look of the film of and of Cvack's use of image and sound to convey story - more often than not what is important is what we see not what we hear. Cva is clearly a director who trusts his audience to pay attention and put all the pieces together. I really like this film a great deal. This is one I want to revisit since I know I missed stuff the first time through. ROAD TO THE WELL is out on DVD from The Candy Factory and can be seen via the major VOD outlets. I loved it. When Jon contacted me to review it, I was not excited, but after I watched this great film I could not believe that it was his first. I just wish that this thing could have somehow made it to the theaters.